The trough level is but a surrogate marker for the true pharmacodynamic parameter for vancomcyin, the 24-hr AUC/MIC ratio. The target vancomycin trough level of 15-20 mg/liter was chosen in the 2009 vancomycin TDM guidelines to maximize the likelihood of achieving a 24-hr AUC/MIC ratio of >400 mg·h/liter. Targeting the trough level has been criticized as trough concentrations underestimate the true AUC by 25% on average. Recent pharmacokinetic data suggest that the majority of patients can achieve AUC values of >400 with trough concentrations less than 15. Although controversy remains regarding whether vancomycin has a direct toxic effect, vancomycin-associated nephrotoxicity has been linked to troughs greater than 15. Monitoring vancomycin by AUC would be expected to reduce unnecessarily high exposure and thus reduce nephrotoxicity. Although clinical data suggest that targeting the daily vancomycin AUC above 400 will ensure efficacy, the AUC range associated with nephrotoxicity has not been clearly defined. Based on current data, it appears prudent to maintain the AUC below 600 (and trough below 20). 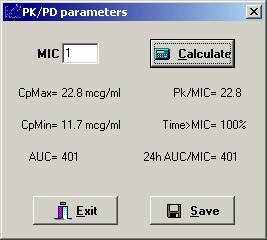 Since 2004 all of RxKinetics PK software has performed PK/PD parameter calculations. Unfortunately this feature was hidden behind a button in APK and AbPK. It makes me wonder how many folks using the software have missed this feature. With that in mind, I’ve moved the AUC calculation in APK up front. No longer hiding behind a button, AUC is displayed along with the predicted peak and trough levels. In addition, a Targeted AUC dialog has been added. This new dialog is accessed via the Tools menu. 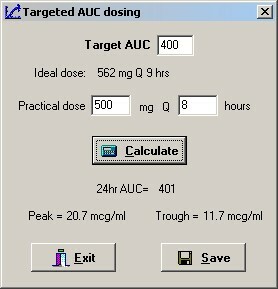 The Targeted AUC dosing dialog does precisely what the name implies. Enter a target AUC and an ideal dose is calculated. This isn’t rocket science. The ideal interval is the half-life plus infusion time (usually one hour), plus distribution time (one hour). Ideal dose is then calculated with the AUC equation rearranged to solve for dose. After entering a practical dose and interval, the predicted 24-hr AUC, peak, and trough are displayed. The PK/PD dialog remains unchanged, and is (still) accessed by the PK/PD button (or via the Tools menu). Click Save on this dialog to copy the appropriate pharmacodynamic parameter. As detailed above, the 24-hr AUC/MIC ratio is the most useful parameter for vancomycin. For aminoglycosides, the peak/MIC ratio is the best predictor of efficacy. Zasowski E, Murray K, Trinh T, Finch N, Pogue J, Mynatt R, Rybak M. Identification of Vancomycin Exposure-Toxicity Thresholds in Hospitalized Patients Receiving Intravenous Vancomycin. Antimicrob Agents Chemother. 2017 Dec 21;62(1). Pai M, Neely M, Rodvold K, Lodise T. Innovative approaches to optimizing the delivery of vancomycin in individual patients. Adv Drug Deliv Rev. 2014 Nov 20;77:50-7. Andrew DeRyke, C & P. Alexander, Donald. Optimizing Vancomycin Dosing Through Pharmacodynamic Assessment Targeting Area Under the Concentration-Time Curve/Minimum Inhibitory Concentration. Hospital Pharmacy. 2009 44. 751-765.